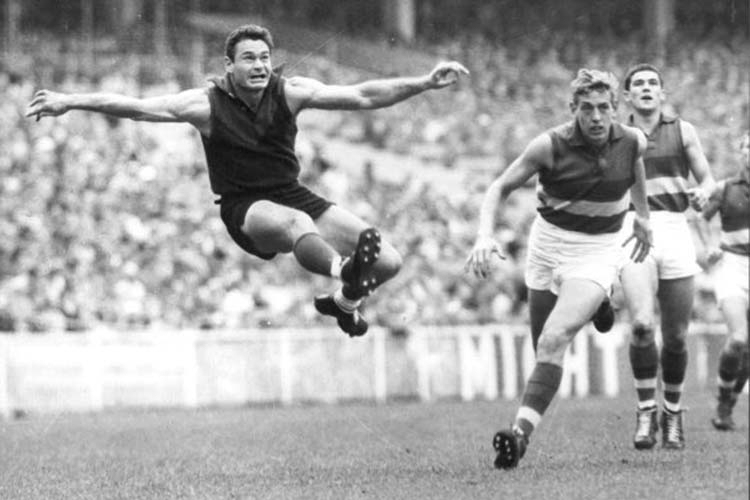 In 1953, a 17 year old Ronald Dale Barassi entered the M.C.G. for his first ever VFL game, he would later become a legend of the game. The story of how Ron arrived at this first game in 1953, involves war, tragedy, rule changes and help from others. 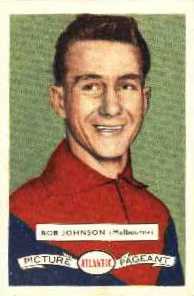 Ron was also not just the only youngster starting in 1953 and others came together to make the 1950's a golden era for the Melbourne Club. This is the story of Ron's first VFL steps. Some footballers enter VFL ranks in blazing style. Who can ever forget John Coleman kicking twelve goals against Hawthorn in his first VFL game? Another instance was when a virtual unknown from Moe (Lester Ross) eclipsed Footscray’s champion Ted Whitten in 1959; but arguably, the most sensational debut in VFL history was made by Bill James. Bill travelled from Kyabram to play his one and only game of VFL football. On that day he kicked the winning goal for Richmond and thus secured the 1920 premiership flag for the Tigers. However, not everyone makes a ‘splash’ in their first game. While football fans recognize and admire Ron Barassi’s long list of achievements in football; it may be hard for some to believe that Ron’s VFL career started with a ‘whimper rather than a bang’! Giuseppe Barassi, Ron’s Swiss-Italian great-grandfather, arrived and settled in the central Victorian goldfields region in 1855. The ‘Barassi’ family story is fascinating and featured in a recent series of SBS television programs entitled ‘Who Do You Think You Are?’ The promotional blurb regarding Ron’s episode said…. “Footy legend and latter day ‘Knight in Shining Armour’ Ron Barassi has always believed that actions speak louder than words. He embarks on a journey into his ancestry tracing the Barassi family line back to the Victorian Gold Rush and discovers a heart-rending tale of violence, tragedy and redemption.” SBS January 2012. 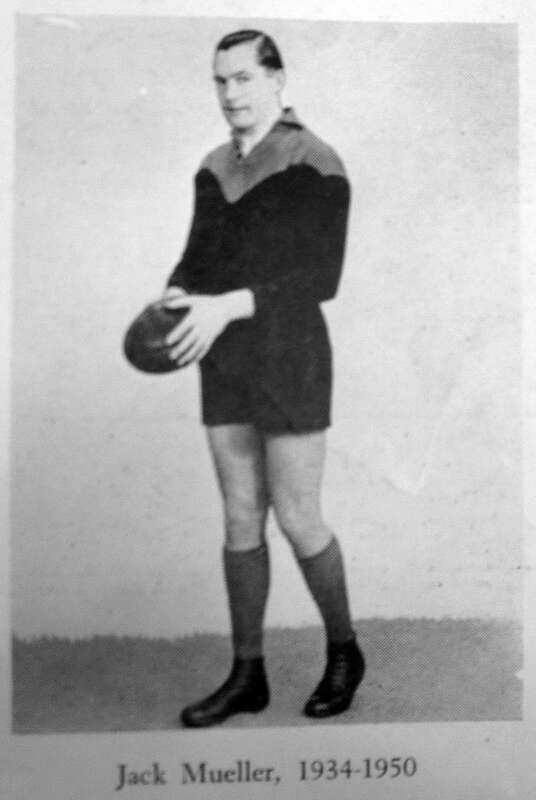 Ronald Dale was born to Ronald James and Elza Barassi at the Castlemaine Hospital on the 27th February 1936. 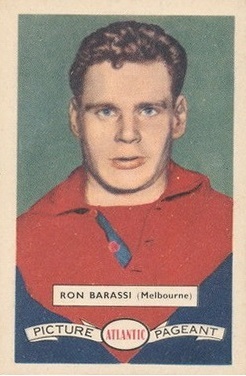 Ron’s second name is the maiden name of his grandmother, Anne Connolly Barassi (nee Dale) a girl from Castlemaine who married his grandfather, Carlo Barassi in 1900. Ron was a ‘child of the depression’ and, as mentioned in others stories on this website, the economic crisis of the 1930’s shaped the lives and fortunes of the great bulk of Australian families. ‘Things were crook at Tallarook’ and elsewhere and life was grim for most; however Ron Barassi (Snr) eked out a meagre existence and kept the ‘wolf from the door’ during those hard times. He was a fine sportsman and it was his ability in football that gave him, Elza and their newborn a chance to get ahead despite the gloom spreading across the nation. Ron (Snr) was a talented footballer and his style of play came under the notice of Melbourne officials when he was playing for Castlemaine FC. Ron was deemed to be a ‘priority recruit’ and his signature was sought with some enthusiasm by MFC. Such are the breaks in life… Within a short time of leaving the bush, Ron (Snr) had secured a regular income, a modest dwelling in the suburbs and was playing football at the highest level. Unfortunately, not everyone in those austere times had Ron’s luck or ability on a football oval. Ron Barassi (Snr) played his first VFL game for Melbourne against Collingwood in Round 7 in 1936. He must have been an adept player as it was no mean feat to break into such a star-studded team which included Jack Mueller, Allan LaFontaine, Eric Glass, Norm Smith, Percy Beames, Johnny Lewis, Maurie Gibb and Gordon Ogden. According to the available records, Ron was 22 years of age on debut. 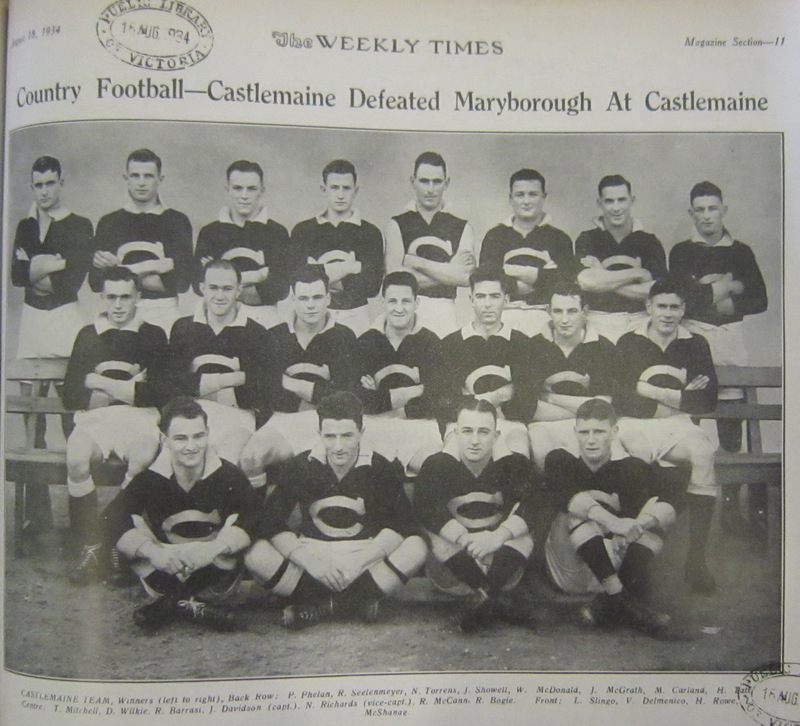 "A courageous rover from Castlemaine-Guildford...was nineteenth man in Melbourne’s 1940 premiership side." 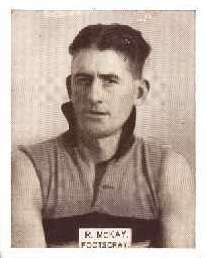 Norm Smith led the charge against Richmond in that 1940 Grand Final. 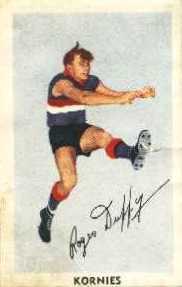 Norm kicked seven goals that day and, along with Ron Baggott, Percy Beames, Jack Mueller and Allan La Fontaine, saw the Demons run out comfortable winners by 39 points. It should also be noted that Keith Truscott, Harold Ball and Syd Anderson played in that victorious team; unfortunately the talented quartet of Barassi-Truscott-Ball-Anderson would later make the newspaper headlines for the saddest of reasons. Like many other young Australians, Ron enlisted in the Army and was soon embroiled in action thousands of miles away from the comparative peace and tranquility of suburban Melbourne. "RON BARASSI KILLED AT TOBRUK….Ron Barassi, former Melbourne footballer, has been killed at Tobruk, according to advice received last night. Aged 26, he will be remembered as a good type of utility footballer. 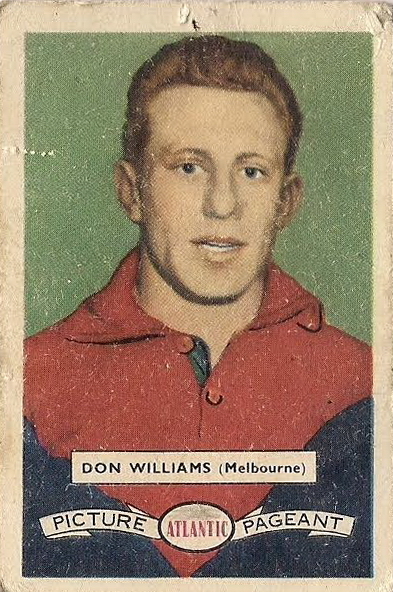 He first played for Melbourne in 1936 and took part in 55 games, scoring a total of 81 goals. Picked as 19th man, he played with the victorious Melbourne team in last year's grand final. Before enlisting he was on the Melbourne City Council staff…" ‘The Argus’ 8th August 1941 Page:5. The World War 2 Nominal Roll indicates that Ron (VX 45220) enlisted in the Australian Army on July 15th 1940 at Caulfield and rose to the rank of corporal. His posting at the time of his death, on the 31st July 1941, was given in the military records as the 7th Divisional Supply Column Mechanical Transport. Ron is buried at the Tobruk War Cemetery in Libya. Ron Barassi’s death brought home, in no uncertain manner, the toll that many families throughout Australia were paying in trying to halt Hitler’s march across Europe and Northern Africa. Ron was just one of thousands of athletes of various disciplines who had died on the battlefields of World War: 2; each had a story to tell about their youthful days of high energy and excitement on the sporting fields of our nation. Of the 57 VFL footballers who perished in that conflagration, Melbourne lost six in number. While most texts on this unfortunate topic refer to the deaths of Melbourne premiership players Ron Barassi (Snr), Keith Truscott, Harold Ball and Syd Anderson; it is often forgotten that Noel Ellis and Jack Atkins were others to die during that war. Noel, who played three games for MFC in 1940-41, was killed during military training prior to embarking for overseas duties. Jack died at sea when the HMAS Perth was torpedoed at Bantam Bay near Java in 1942. Jack played four VFL games. While the death of Ron Barassi (Snr) shocked and saddened all football lovers it had a devastating and life-long impact on young Ron; and he has carried the loss of his father with a heavy heart throughout life. Ron is quite open in saying that he still grieves, in his personal way, about the loss of his dear father. In 2011 he wrote…. "My own father lost his life at Tobruk …and lies in such a Commonwealth war grave in Libya. Though I was only five at the time, I can still remember the overwhelming grief which consumed our home when a telegram informed us of my father’s death." "Contrary to my aggressive warrior reputation in football, I deplore the folly of war and misplaced gratuitous violence in any form…" ‘Wisdom’ Page: 114 . Things changed rapidly for Ron following the death of his father. The family made a painful decision that it would be best for Ron to leave Elza’s care and live with his Grandfather (Carlo) and Aunty May on the family farm on Shicer Gully Road in Guildford. Elza was working at Miller’s Rope Works, a national company , where many Demons players and officials were employed. "…he (Ron Jnr) thanks his mother for a certain toughness which helped when there were blocks and pitfalls." ‘Fallen’ Page: 220. "Ron outran and outplayed everybody at primary school and punched above his weight….Even in the bush, where there was no competition, the boy set himself goals and tests to see how far he could go, how much he could achieve…" “Barassi’ Page : 32. "…every boy makes his father a hero, especially in early life. This experience fortified and maybe reinforced my courage ‘glands’ and I occasionally conquered fear by being too scared to show I was scared." 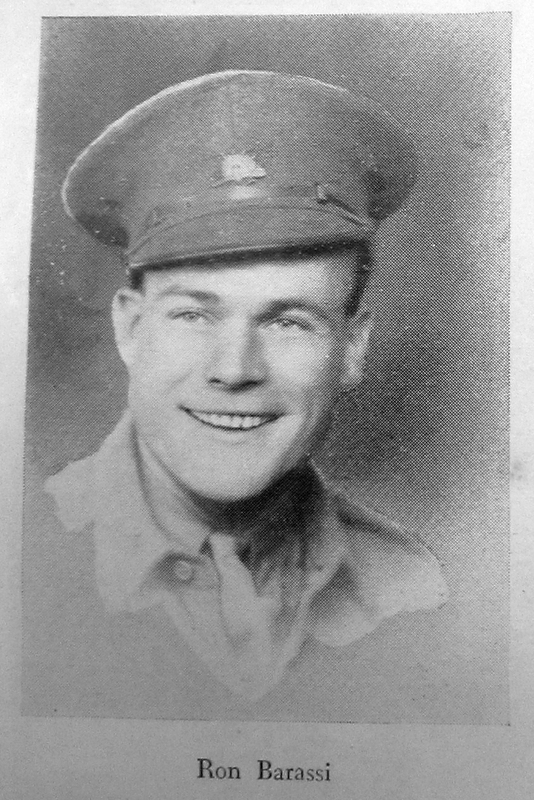 Ron lived in Guildford during the war years; and when Carlo became ill in 1947, Ron returned to the city. It is not written as such but it appears that life at Shicer Gully Road had been instrumental in preparing Ron (Jnr) in so many ways to meet the challenges that would confront him during his teenage years. Having started his secondary schooling at Castlemaine Technical School, Ron also attended two technical schools on his return to Melbourne (Preston 1948-50 and then Footscray Senior Technical School in 1951-2). He later attended evening classes at RMIT. Ron was a determined and spirited youngster who showed ‘noticeable flair’ as he moved into competitive sports and games. 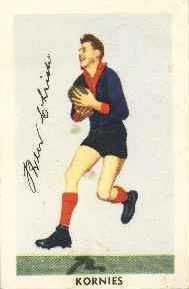 His early games of football were with the Preston Scouts FC; and at the young age of fifteen years Ron commenced training with Melbourne Thirds. It would have been difficult for Ron not to gravitate towards wearing the red and blue colours of Melbourne as so much of his early childhood had been in the company of his father’s former team mates. Young Ron was well liked by his father’s friends and it is believed that they steered Ron in quiet and often unseen ways; and of course, there was the ever-watchful eye of Norm Smith who held the interests of Elza and young Ron close to his heart at all times. "…young Barassi’s father had played with their club, shouldn’t the next generation play there too? This was the initiation of the now long standing father-son rule." Peter McFarline. As a result of Melbourne’s initiative, the VFL adopted the ‘Father and Son Rule’ in 1951. Oddly enough Ron Barassi was not the first player to be secured by a VFL club under the ‘new’ rule. 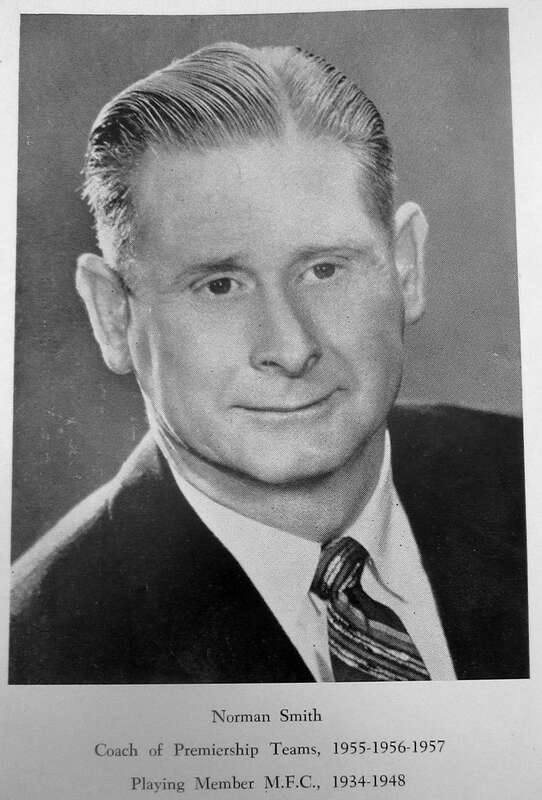 In June 1951, the rule allowed Harvey Dunn (Jnr) to play with Carlton despite being ‘zoned’ to North Melbourne ( Harvey was then living in Flemington). Other noted father-son combinations at Melbourne FC include Jack & Geoff Collins, Ritchie & Ken Emselle, John Lord ( Snr) & John Lord (Jnr), Adrian & Anthony Dullard, Bob Johnson (Snr) and Bob Johnson (Jnr) and , of course, Ted Cordner and his famous sons. Ron Barassi (Jnr) had three outstanding coaches in his time at the Melbourne Football Club; they were: Norm Smith, Jack Mueller and Roy McKay. Roy also represented Victoria on two occasions and further research shows that he was a most successful VFA coach. He is also regarded as one of the best VFL development coaches in the 1950’s and 60’s. "Brunswick were minor premiers in 1936 and 1937, topping the ladder at the end of the home and away series and in 1938 defeated Brighton to win their third (and final) VFA premiership." ‘Boyles’s Football Photos’ website. "McKay's Great Service…Roy McKay, Brunswick's skipper, has given long and faithful service to the game. He has just completed his 15th year with League and Association, and it is in the lap of the gods whether he strips next year… Since he took charge at Brunswick, the Magpies have had a wonderful record in the finals…" September 11th 1940. With such an impressive background in playing and coaching, it is little wonder that Roy was appointed to coach Melbourne Seconds in 1945. 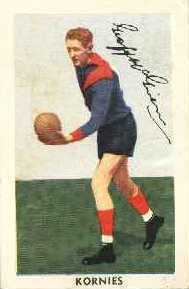 He then coached the MFC Thirds in three stints between 1950 and 1966. Roy had much to do with ensuring that budding players, like Ron Barassi, were equipped to cope with the pressures and demands of senior VFL football. "Roy was a humble and knowledgeable coach who was held in high regard by our players and officials, particularly Norm Smith. Roy, like Norm, had high expectations and standards and he was a strong orator. We won the Under 19 Grand Final in 1964 and Roy deserved great credit for getting us over the line against Collingwood that day." Neville, who played 35 VFL games (1966-69) also gained great success as a coach in country football. Neville, now living in Leongatha ,believes that the Third XVIII, under Roy McKay’s astute guidance, was a most fruitful ‘breeding ground’ for Melbourne FC and was a significant factor in the ascent of the Demons in that era of VFL football. Young Ron had coped admirably with all that life had thrown at him but he received another jolt when Elza announced that she intended to re-marry and start a new life in Tasmania. From reading the texts on Ron’s early days , it is apparent that he was a resilient and irrepressible youngster but Elza’s decision to leave threw a ‘spanner in the works’ and it is at that juncture that Norm Smith stepped in to resolve a difficult and delicate family situation. Elza and Norm discussed all the possible options at length, particularly Ron’s future football career, and it was agreed that Ron would live with Norm and Marj Smith. "Norm was extremely fond of Elza and there is no doubt that because of his friendship with Ron’s father he felt a rare attachment to the boy." Peter McFarline Page : 27. So, Ron moved in with the Smith family - in a new backyard bungalow - and a new chapter in Ron’s life unfolded. In 1994, Ron wrote an engrossing chapter for Brian Nankervis’ book entitled ‘Boys and Balls’ where he commented upon the impact of Norm Smith on his life…. “Norm Smith- I owe a great debt to. I went to live with the Smiths just before I was seventeen and I was there until I was twenty-one. Being an independent, free spirited person I probably needed a firm hand and Norm was that but he also had very good ethics and morals and value systems. You had to toe the line and yet he still liked his fun. He was like a father to me at that period; it was good that I had a strong hand. He was a good man and a strong man and as far as football was concerned he was a genius.” Page: 134. Norm’s firm discipline had a settling effect on Ron and, after a faltering start, he began a spectacular climb to new and heady heights as a VFL footballer. While Norm was Ron’s guiding light, the influence of Melbourne’s Second XVIII coach, the legendary Jack Mueller, should not be discounted in Ron’s development in those early years. Norm Smith and Jack Mueller had played a combined total of 443 VFL games and were/are two giants in the history of Melbourne FC. Ron duly profited from their vast experience, drive and the high standards which they set for every player on the Melbourne list. Ron absorbed the lessons of his coaches; and the grounding he received in his teenage years would stand him in good stead for the rest of his life. 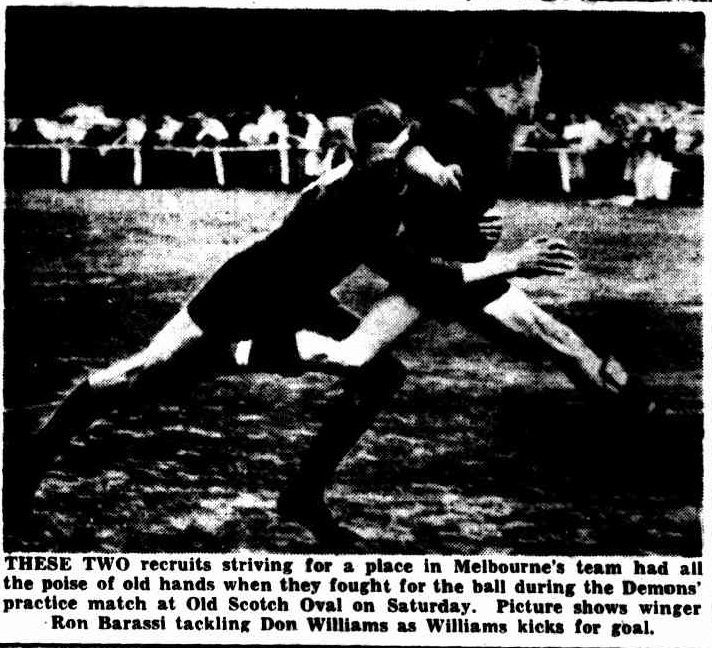 "Changes in position are likely this week, and there will be opportunities soon for Don Williams, a half-back flanker; Peter Marquis, a ruckman; and Ron Barassi, who instead of playing on the half-back line as usual, was stationed at centre half-forward and full forward for the seconds last Saturday. All three starred." - ‘The Argus’ May 6th 1953. 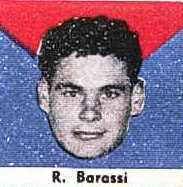 Ron Barassi made his Senior VFL debut in 1953 in Round 4 against Footscray. He must have felt very proud running out onto the MCG wearing the red and blue guernsey with number 31 (his father’s number) on his back for his first senior game of league football. What boy wouldn’t? The Footscray team appeared to be well balanced across all lines but the Melbourne team, as published, looked a little experimental. With the advantage of hindsight, some Melbourne players were clearly ‘playing out of position’ (e.g. John Beckwith, Stuart Spencer, Noel Clarke and Peter Marquis); and perhaps Norm Smith was ‘sifting and sorting’ to find a winning combination for the future. 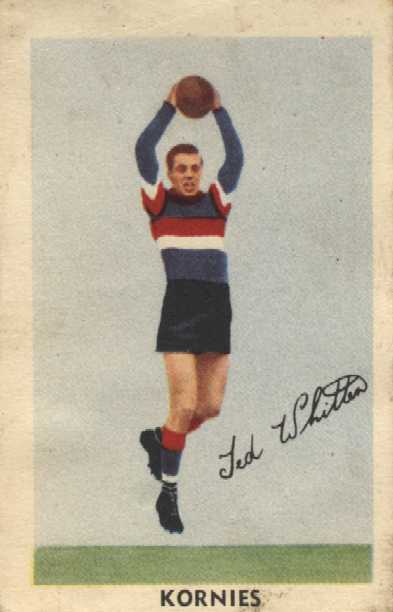 There was nothing in that game to excite Melbourne supporters that day; and the scoreboard revealed that Footscray’s brilliant defence led by Ted Whitten and Herb Henderson kept the hapless Demons forwards goal-less in the first half of the match. It was a sizeable crowd of in excess of 23,000 at the MCG and, while the Bulldogs fans loved every moment of the game, it was a disappointing afternoon for the loyal Melbourne barrackers. "Melbourne staged a series of direct thrusts in which Williams and Albiston were prominent. Three goals resulted before Footscray struck back for a single." ‘Sporting Globe’ May 16th 1953. For young Ron Barassi it could hardly be called an ‘auspicious debut’ as he spent most of the game sitting ‘on the bench.’ As there were no rotations or interchange in that era of football, Ron had a very long wait before seeing some ‘real action’ that day. According to Cyril Nott ( ‘Sporting Globe’), Jack Thompson replaced Dale Anderson (see below ), who had sustained a leg injury, at three quarter time but Ron was still ‘wearing his dressing gown’ when the last quarter commenced. "Barassi had almost gone mad waiting and admits that he ran about like a chook with its head cut off…." With the clock ticking down and Ron desperately trying to impact on the game, he charged at Charlie Sutton with the intent to bring down the Bulldog leader. However, at the last moment Charlie baulked and maneuvered past Ron leaving him looking ‘like a fool’ (Ron’s own description of that moment). Ron had hardly broken into a sweat when the final siren rang and Footscray claimed a comfortable victory by 45 points. It is known that following the match Charlie Sutton and Ron had a brief chat and Ron received some prudent advice about tackling from the Footscray champion. Charlie’s brief but salient comments were never forgotten and, in time, Ron became renowned for his tenacious body tackling. While Ron does not feature in any of the match reports of his first game, it is nonetheless interesting to reflect upon the events in that game. Melbourne failed to score a goal in the first half and had only managed one solitary goal up until three-quarter time. It must have been a day of mixed emotions for Ron as he watched and waited for his cue to enter the arena. Two other teenagers were named ‘best’ for their respective teams that day. 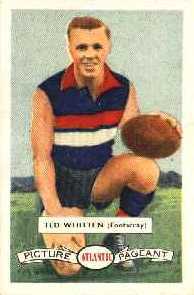 Ted Whitten starred for the Bulldogs and Melbourne was best served by a youngster named Don Williams. Don was recruited from Elsternwick (VAFA) and was playing only his second game of VFL football. In time, both would become household names and champions of the VFL. On that day, five teenagers took the field. They were: Ron Barassi (17), Don Williams (17), Ted Whitten (19), Ron McCarthy (Footscray,18) and Brian Gilmore (Footscray, 19). The oldest player in that particular game was Footscray’s coach Charlie Sutton who was 29 years of age. Note: Historians often highlight the youthful profile of the Melbourne team of that era. However, while the average age of the Melbourne team that day was 23.3 years; it should not be overlooked that Charlie Sutton’s team was a ‘smidgeon’ younger with an average age of 23.2 years. 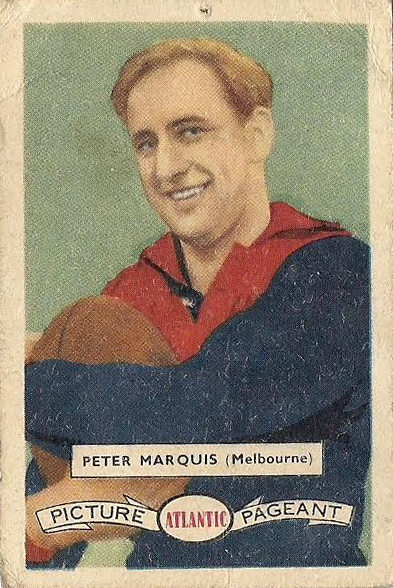 Maurie Reeves who played first rover for Melbourne that day returned home to Warragul (LVFL) in 1954. Maurie was a courageous small man and a brilliant ball-handler. However, as is often the case, his departure ‘opened the door’ for Stuart Spencer. Stuart, selected in the back pocket that day, soon assumed the roving role at MFC and, in time, became the best rover in the history of the club. He was named in MFC’s Team of the Century as first rover. "Just a year ago, on March 1, Footscray's young and brilliant centre man, Peter Box, was riding his motor cycle to practice when he crashed. His left leg was torn open and the knee injured. He was rushed to Royal Melbourne Hospital where he spent 12 weeks on his back." March 4th 1953. 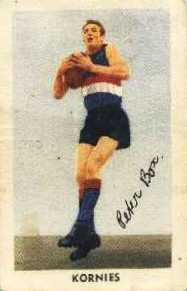 Not only did Peter return to VFL ranks but he was a member of the Bulldogs’ 1954 premiership team. In one of the best stories of resilience and dedication in league history, Peter won the Brownlow Medal in 1956. “He was made vice-captain in his third year and played in two premierships before becoming an ordained Presbyterian minister at the end of 1956 and moving to London to take up a position with a church in Stepney.” Demonwiki. Another young emerging VFL star Roger Duffy (21 years) kicked four of Footscay’s nine goals that day. 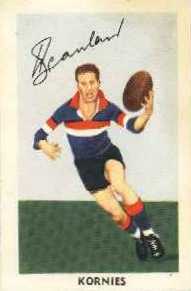 Roger arrived at the Western Oval from Newtown FC (NSW) and he would, in time, prove to be one of the Bulldogs’ finest players of the 1950’s. 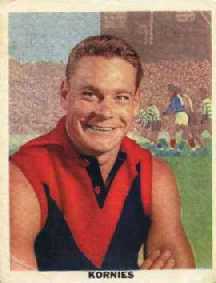 Roger played 117 games (116 goals) and represented Victoria in 1957. 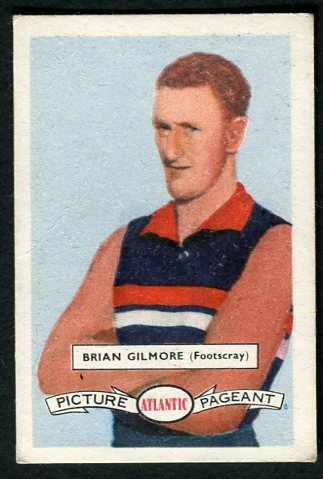 Bill Morrow, who kicked Melbourne’s opening goal in the above match, played only a handful of games in the VFL. 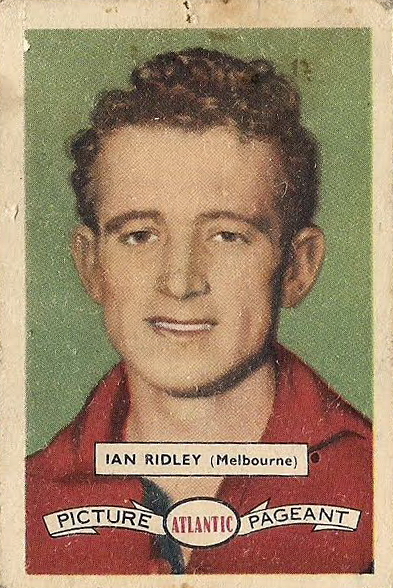 Bill was a strong centre-half forward who had starred in Prahran’s premiership victory in 1951. 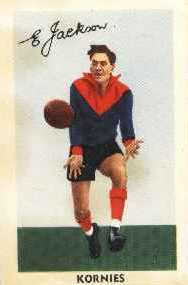 The records show that Bill played only six games with Melbourne before returning to VFA ranks. A little known player of that period was John Barrett who was named on the bench for the Bulldogs that day. 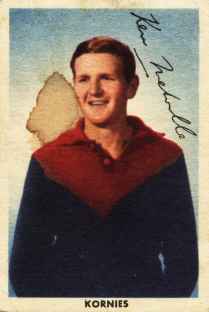 John was recruited from Frankston FC in 1950 and played 33 games until being cleared to Fitzroy where he notched up a further 22 games. Several press reports, of that era, indicate that John, better known as wingman, became a solid and reliable defender at Fitzroy FC. Jack Thompson who ‘sat on the bench’ that day with Ron Barassi was a loyal, perhaps under-rated, servant of the Demons. 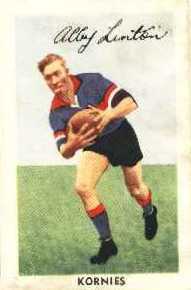 Jack played 64 games between 1949 and 1953. Originally from Prahran, he was a ‘handyman’ who could ruck, play in defence or ‘go forward’ and be an effective goal kicker. 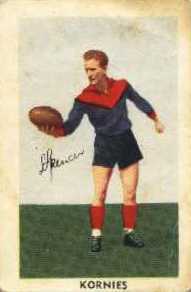 Jack kicked 46 goals for Melbourne and in 1950 polled eight votes in the Brownlow Medal. It is documented that Jack was appointed coach of Nhill FC in 1954. Footscray’s back pocket in the above match was Jack King. Although Jack spent six seasons at the Western Oval his tally of VFL matches was a mere thirty-six. It is known that Jack was recruited to Footscray from local club Spotswood; and an article in ‘The Argus’ indicated that Jack was cleared to Yarraville FC ( VFA) in 1954. Dale Anderson was a brilliant sportsman who starred in Tasmanian football and was a prolific goal kicker for Cooee in the NWFU/TFL. "At the time of his debut in the VFL he held the record for the most goals by a player in a Tasmanian league game." ‘Demonwiki website’. 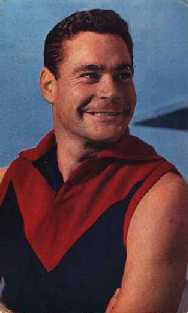 Dale played seven games for Melbourne before crossing to Williamstown in 1954. Peter Marquis, Stuart Spencer and Noel Clarke were other players who had also been recruited to MFC from Tasmania in that period. Dale was also an outstanding cricketer. If Ron thought he had a long time on the bench against the Bulldogs, then the wait before his next game must have been excruciating. Ron returned to the Seconds team after the Footscray-Melbourne game. However, after several strong performances the Melbourne selectors named Ron, on the half forward flank, for the Round 11 clash against St Kilda. It was to be his first full game of VFL football. Geoff Case (ex-Melbourne High School), Ralph Lane (ex-Frankston), Bob Constable (ex- Murtoa) and Peter Schofield (ex-Mentone/Richmond) were brought into the team that day at the expense of Jack Thompson, Mike Woods, Bill Morrow and Dale Anderson. Note: Peter Schofield was cleared to North Melbourne in 1957 and played a further 50 VFL games. "The form of the Seasiders ruffled the Demons and strong play by the Saints resulted in a further four goals. Roberts had scored five goals without a miss." Neil Roberts’ five goals were telling in such a tight contest. Neil went on to become one of the best defenders in that era; and in 1957 his brilliant performances at centre-half back were rewarded with a Brownlow Medal. Melbourne started the last term full of fire and run and late goals brought the margin back to less than a goal. As the clock ticked down Maurie Reeves slotted a goal and the Demons momentarily hit the front. It had been a magnificent fight back but was to prove ‘to no avail’ as Peter Bennett ( St Kilda) quickly replied to restore a narrow lead and the Saints held on to win bravely by four points. "I can remember getting seven free kicks that day and I had the chance to be a hero in my first full game. I grabbed the ball on the half forward line and I was just about to sink the winning goal in the last few seconds, the sort of stuff you dream of, and bang, I went down with a tackle." ‘Boys and Balls’ Page: 135. It was Melbourne’s tenth defeat that season and the Demons sat clearly on the bottom of the table with just one win. “The Sun included his name among the best players noting that he made a promising debut at half-forward.” Page: 53. "…because my father was the first league footballer killed in the war people he looked upon me kindly." ‘Balls and Boys’ Page:135. Neville was an enigmatic and, at times, troubled character who, despite being one of the most gifted youngsters to play VFL football in that era, quit league football after just 43 games. In the match against Collingwood at the Junction Oval in 1957, Neville kicked five goals and led the Saints to a magnificent victory and then ‘hung up his boots’ at just twenty-four years of age. 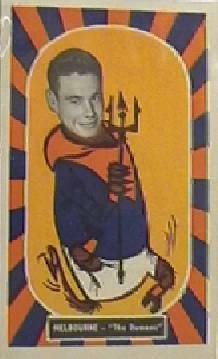 "MELBOURNE supporters have a warm spot for 17-year-old Ron Barassi, who on Saturday was having his second full game with the Demons. Ron who was in 31 guernsey the same number his father wore with Melbourne before being killed in action at Tobruk, is the makings of a good player. He is bigger than his father and showed great promise on the half forward flank." Within a season or two, Ron would be rarely out of the limelight and would become the subject of intense media scrutiny as his reputation as a star player of the VFL spread far and wide. Ron must have impressed Norm Smith and his co-selectors in that game at the Junction Oval against the Saints as he was selected for the next fixture against Richmond. He played another three games that season; and altogether Ron was selected for six games (including three matches as a reserve) that season. Ron’s last game in 1953 was against Geelong and the Cats thumped the Demons by 54 points. For the Melbourne supporters there was little to get excited about during the dreary drive home from Kardinia Park that evening. However, little did Melbourne supporters realize that within one season the club would be ‘back on its feet’ and ready to take a tilt at the flag in 1954. Ron Barassi, Geoff Case, Terry Gleeson, Peter Marquis, Tony Bull, Ken Melville, Frank Adams and Don Williams debuted for MFC in 1953 but they were only part of the Demon’s rebuild. Throughout that season, Melbourne officials were exceedingly busy as they systematically scoured country and suburban leagues to find other quality recruits to strengthen the playing list. 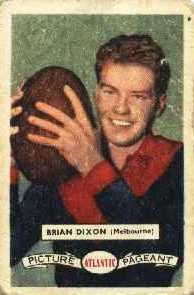 During the summer of 1953-54, Ian Ridley (Hamilton Imperials), Clyde Laidlaw (Portland), Bob B Johnson (Melbourne Thirds), Laurie Mithen (Ormond Amateurs), Colin Wilson (Ormond Amateurs), and Brian Dixon (Melbourne High School) signed with the Demons; and with such an array of talented recruits a new era was dawning at MFC. The meteoric rise of Melbourne and the emergence of Ron Barassi, as a true champion of VFL football in the ensuing decade, are now history and well documented for all to read. There have been thousands of words written about Ron Barassi and there will be many more penned about his life and times in the years ahead. Ron was unique. Not only was he a fine footballer and an inspirational coach but he is a highly respected man in all veins of Australian society. After considering many tributes about Ron, the following passage has been chosen to bring this story, about a modern-day Australian hero, to a fitting conclusion…. "Ronald Dale Barassi is a legend for many reasons: incredible footballer, revolutionary coach, enduring media personality. For more than fifty years he has been one of the most influential people in sport and the shadow he casts is matched by few, if any. Footballers are often branded heroes or villains according to team colours, but Ron Barassi is loved and respected by all. He has truly become the father of the modern game, and will always be remembered as one of the all- time-greats." ‘Wisdom’ 2011. •	Former Melbourne FC player Neville Stone for recording his memories of Roy McKay. •	Rosemary Long (Ron Barassi’s Manager) for her kind advice and assistance with this story.